We invite you to explore India - the Land with infinite beauty ! Whether you soar high into Himalayas or peer under the ruins of the Ancient monuments dotting the landscape of India, you will cherish the experience long after your visit ! This India Travel Guide on Fatehpur Sikri is free from any commercial interest! This site is dedicated to promote India - the vast subcontinent, its glorious past, magnificent landscape and its infinite variety. Fatehpur Sikri or the 'City of Victory' was the first planned city built by the Mughals. The city though abandoned now showcases a versatile yet creative architecture suggestive of a beautiful city in the past. The city is a stunning representation of Mughal architecture - a perfect blend of Indian, Persian and Islamic architecture. The city was built by the Mughal Emperor Akbar in the honor of a Sufi saint named Shaikh Salim Chisti. This saint foretold the birth of a son (who later became popular as Jahangir) for Emperor Akbar. Fatehpur was earlier known as Fatehabad (as Akbar named it), later Fatehpur and now Fatehpur Sikri. Fatehpur Sikri was the Mughal Empires capital from 1571 until 1585. Sikri is located on the banks of a lake in Agra, Uttar Pradesh. Fatehpur Sikri encompasses royal palaces, Jama Masjid, numerous buildings, courts, etc. All the palaces were built of red sandstone and had ornamental arches, pillars, brackets-and-chhajjas, etc. The city remained abandoned from 1585 until 1619 when Jahangir used this place as his refuge for a few months. It was left abandoned from then on until 1892 when archeological explorations were conducted. A large number of Jain sculptures and inscriptions have been found during the excavations conducted by the Archaeological Survey of India. Sikri also finds a mention in the Mahabharata proving its existence since prehistoric period. This phantom city is being preserved perfectly. All the monuments in Fatehpur Sikri bear the unique stamp of Islamic architecture but you can notice traces of Gujarat and Rajasthani styles in a few areas, fancy jali work and carving styles. The entire city of Fatehpur Sikri is built in red sandstone, save the marble monument of Salim. The town planning is best seen in the water supply and drainage system. Jama Masjid: Jama Masjid or Friday Mosque was one of the first buildings that were built in the Fatehpur Sikri complex. The Buland Darwaza is a major attraction. Buland Darwaza: It is located on the south side wall of the Jama Masjid. 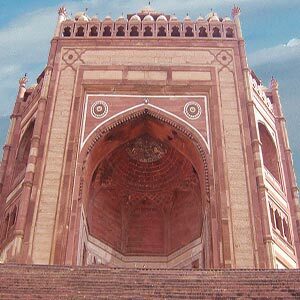 It is 54m high and serves as a huge entrance to the Fatehpur complex. The central portico has three arched entrances, the large one located at the centre is called the horseshoe gate as people used to nail horse shoe to the door to earn good luck. Tomb of Salim Chisti: A white marble tomb is dedicated to the Sufi saint who foretold the birth of a son for Akbar. Panch Mahal: It is a five-storied palatial structure. The tiers diminish in size as they go up; the single-large final dome is called the chhatri. The portico is elaborate; the sub-divided interiors suggest that this place was built for women. Birbal's house: Birbal was Emperor Akbar's favorite minister. His house is located within the Fatehpur Sikri complex. Naubat Khana: It is a drum house and is also known as Naqqar Khana. Musicians used to drum from this place to announce the arrival of the emperor. It is understood to have been the royal entrance. Diwan-i-Am: This is the hall where the emperor met the public. In the Diwani-i-am, you can find the paved courtyard or Pachisi which was the spot for playing chaubar, a game much like chess. Diwan-i-Khas: This is the hall where the emperor met special people for private audience. Mariam-uz-Zamani's Palace: The residence of Akbar's wife. This palace has an influence of Gujrathi architecture and has been built with care to provide complete privacy. The harem wing of Jodha Bai has a blend of Hindu and Islamic architecture. The Hawa Mahal has intricate stone lattices. Located nearby is the Golden Façade or the part of the palace for Akbar's Christian wife from Goa - Miriam. Its interiors were richly embellished with gold. Nangina Masjid: It is located between Birbal's Palace and Elephant Gate and served as a private mosque for the ladies of the harem. The Stone-Cutters Mosque: The mosque was erected for Fatehpur's quarrymen. Apart from the above there are a few other buildings within the complex of Fatehpur Sikri. You can find a licensed guide to show you around at Shahi Darwaza. Don't forget to sample the famous nana-khatai sweet, a specialty of this place. Fatehpur Sikri is well connected by road and rail. You can travel to Fatehpur Sikri by road from Agra which is 40 km away. The airport at Agra has flights from Varanasi, Delhi and Khajuraho.